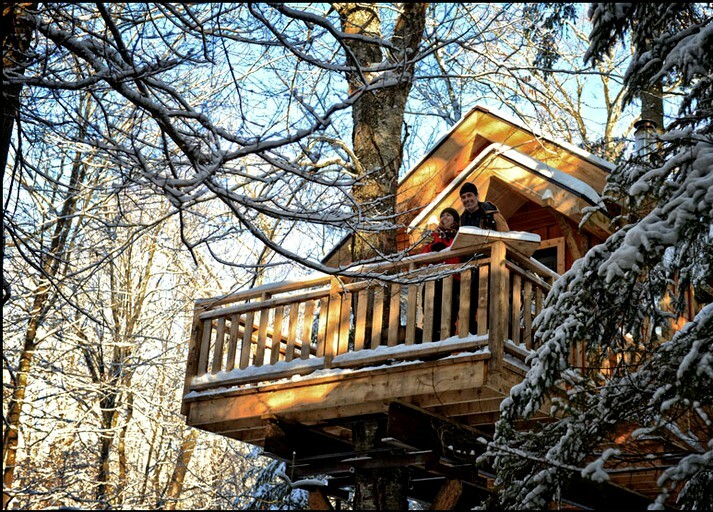 Glampers who are looking for a unique rural retreat from the nearby city of Mont-Tremblant need look no further than this cozy tree house rental, nestled in the boughs of a spruce and yellow birch tree. 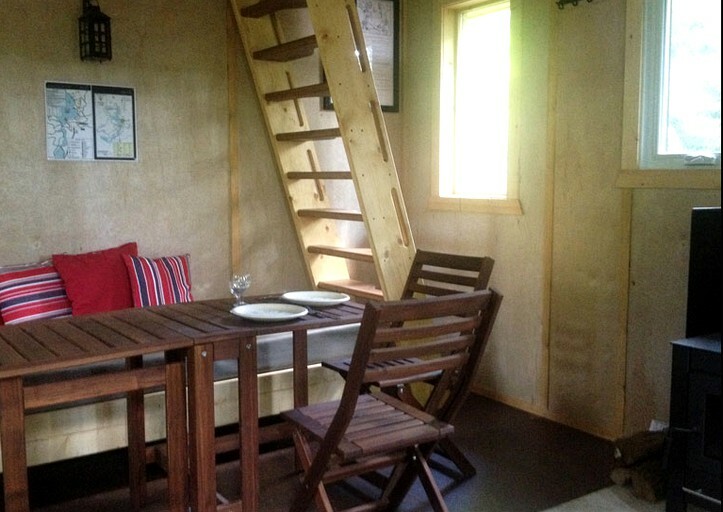 The accommodation is furnished with a double bed in a wooden loft area, and two twin beds, making it perfect for small groups of glamping friends and families. 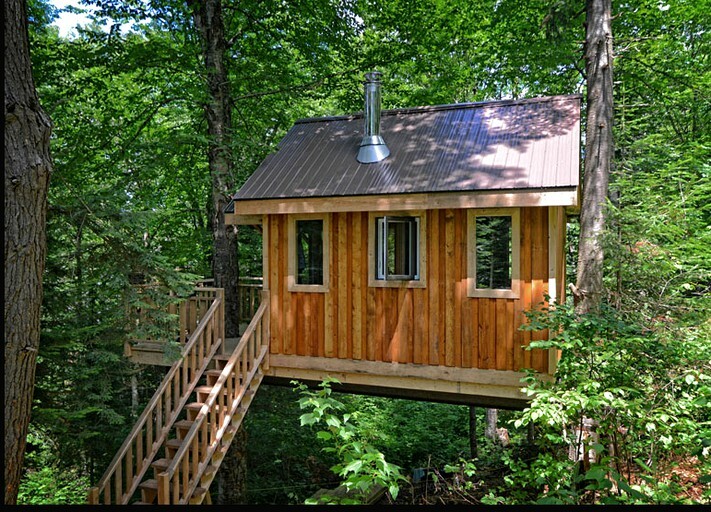 Guests can be entirely self-sufficient up in the trees, as there is a small kitchenette equipped with all the necessary utensils to prepare a simple home-cooked meal. There is a propane stove and a barbecue that guests can freely use, although propane is not included. Glampers can either bring their own propane or buy some from the on-site shop. 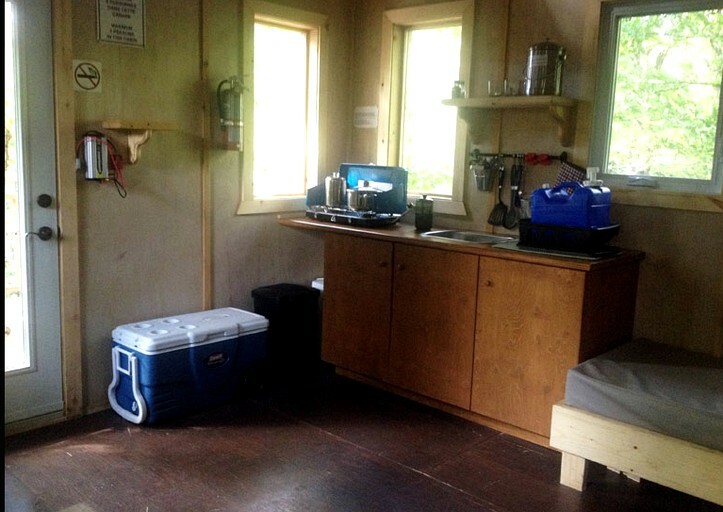 Just outside the tree house, there is a fire pit and a clean composting toilet. 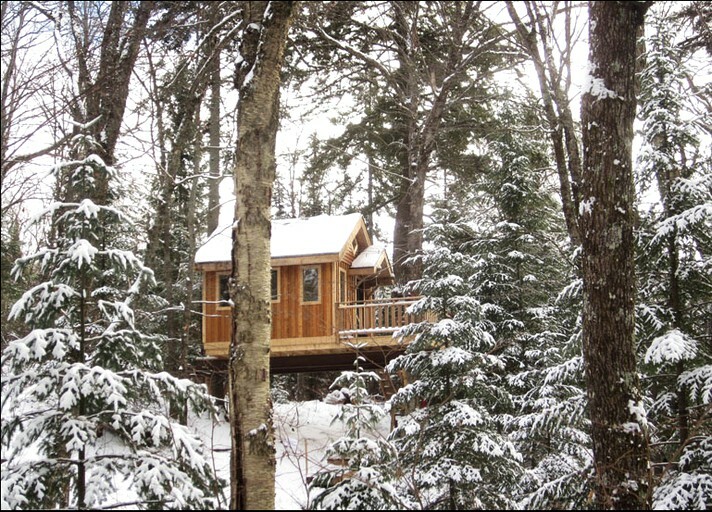 Full bathrooms with showers are located at the main lodge, as well as laundry facilities, Wi-Fi, and even a small convenience store in the summer months. Full bathrooms with showers are available at the reception of this glamping site. There are also laundry facilities, Wi-Fi, and a small convenience store that is open during the summer. There is a lovely covered gazebo on the water for picnics, and there is another covered area on site that can accommodate groups of up to 80. Guests are provided with canoes to transport their luggage when arriving and leaving their tree house rental. Complimentary toboggans are provided for guests to enjoy in the winter. Propane for cooking is available for $8.50, and bags of sustainably sourced wood are available to buy at the reception pavilion, in the small convenience store. Canoes can be rented at the cost of $40 a day. There are endless possibilities for outdoor fun at this glamping site in Canada, whether guests are looking to have a relaxing picnic or a refreshing swim in a lake. 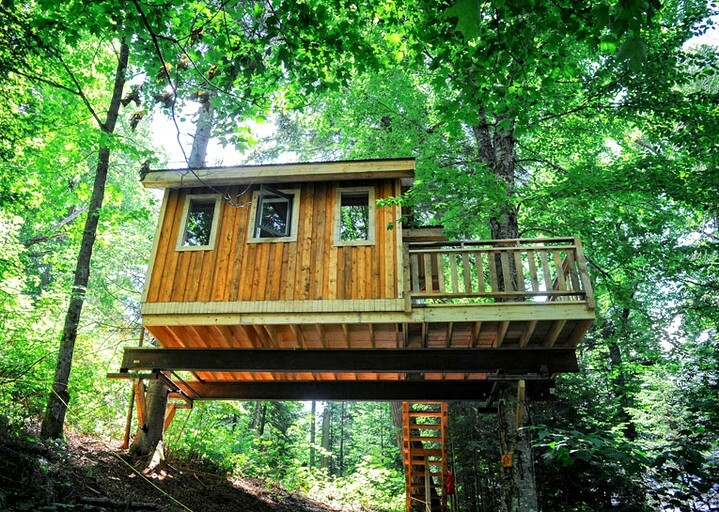 There are miles of trails surrounding these tree house rentals, so hiking is a popular option for guests who wish to explore the wildlife surroundings. Guests can also try fishing in one of the three stocked lakes on site, or they can rent a canoe, a kayak, a pedal boat, or a rabaska to take advantage of beautiful Lake Cordon. During the winter, snowshoeing through the forest and mountains is a fantastic way to spot animal tracks and beaver lodges. Same day bookings are not accepted. 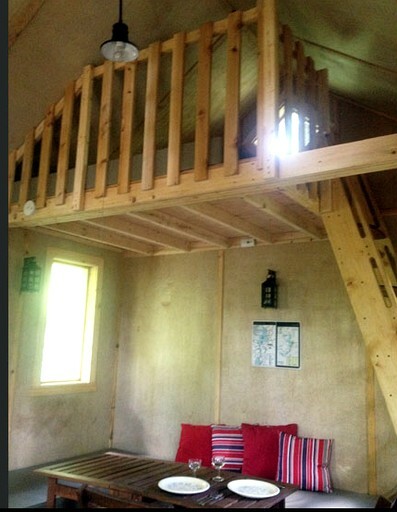 There is a two-night minimum stay at this glamping site during weekends. 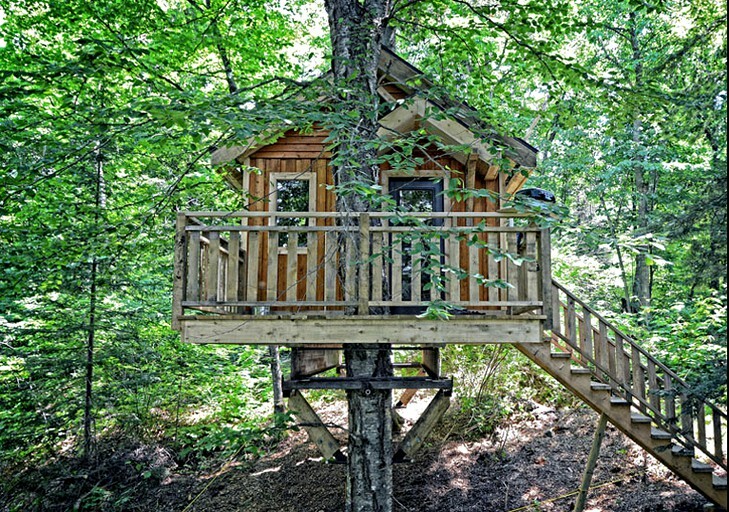 Rates are per tree house, per night for two adults or two adults and two children. There is an additional $15 fee per additional guest. Children under the age of five can stay for free. Rates vary according to the day of week and time of year. Check-in is between 3 p.m. and 5 p.m., and check-out time is between 9 a.m. and 11 a.m. 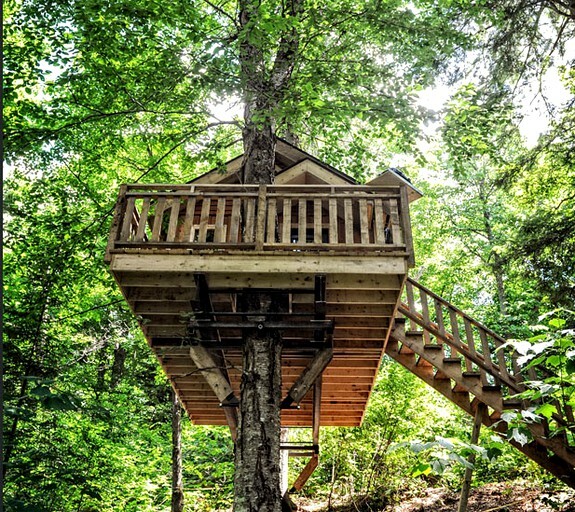 If guests require different checking-in times please contact the host after booking, but should know the canoe option of getting to the tree house may not be available in the evening as it gets too dark for it to be safe. Guests must bring their own bedding, i.e. sleeping bag and pillow. If need be, guests can purchase a pillow and sleeping bag on site for $40, please let the hosts know before arrival so they can get it ready. Electricity is limited and is only available with the rental of a power supply battery at $7 for 10-15 hours with the lighting lamps in the cabins, and four to six hours for charging cell phones and tablets. Hosts recommend that guests bring the bare minimum with them, as they will have to transport their luggage themselves, either by canoe or by hiking.